New observations obtained as part of the Hubble Tarantula Treasury Program view deep inside the Tarantula Nebula, revealing more than 800,000 stars and protostars embedded inside the nebula. 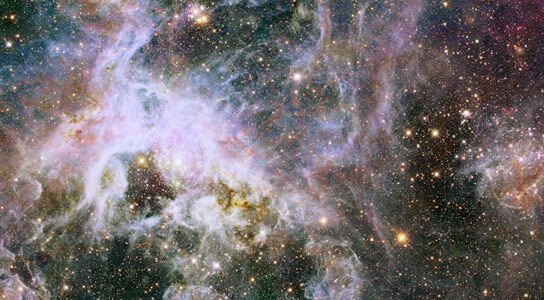 Like lifting a giant veil, the near-infrared vision of NASA’s Hubble Space Telescope uncovers a dazzling new view deep inside the Tarantula Nebula. Hubble reveals a glittering treasure trove of more than 800,000 stars and protostars embedded inside the nebula. These observations were obtained as part of the Hubble Tarantula Treasury Program. When complete, the program will produce a large catalog of stellar properties, which will allow astronomers to study a wide range of important topics related to star formation. The first results from this program have been published in the Astronomical Journal and are being presented at the 223rd meeting of the American Astronomical Society at National Harbor, Maryland. Because it contains the nearest observable super-cluster of stars, the nebula is a nearby laboratory for seeing close-up a firestorm of star birth that was much more common in the early universe. Hubble can resolve individual stars and many red protostars as well as aging red giants and supergiants, giving astronomers new insights into the stars’ birth and evolution. The huge Hubble mosaic, assembled from 438 separate images, spans 600 light-years. Because of the mosaic’s exquisite detail and sheer breadth, astronomers can follow how episodes of star birth migrate across the region in space and time. “Because of the mosaic’s exquisite detail and sheer breadth, we can follow how episodes of star birth migrate across the region in space and time,” said Elena Sabbi, an astronomer at the Space Telescope Science Institute in Baltimore, Maryland, and the principal investigator of the observing team. The new infrared Hubble mosaic is revealing a multitude of pockets of star formation. These regions will likely merge into larger clusters. The Tarantula Nebula’s vigorous star birth may be fueled partly by gas stripped from a small nearby galaxy, the Small Magellanic Cloud. One question researchers hope to answer is whether supermassive stars always form in clusters, or whether they can be born in isolation. 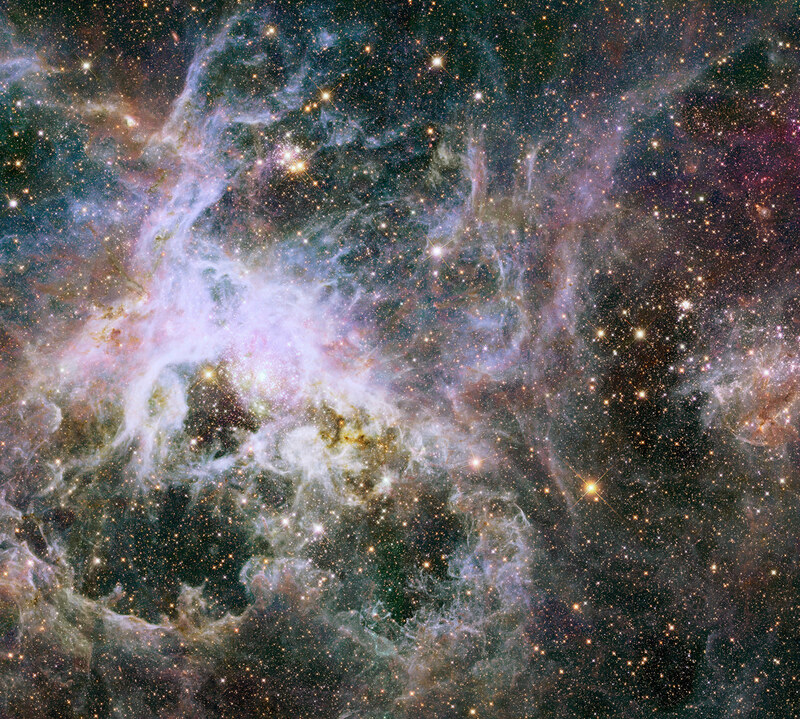 Be the first to comment on "Hubble Views the Interior of Tarantula Nebula"